Due to a number of unfortunate circumstances the 1940’s rock scene has been largely resigned to the ash heap of history. Rock was a genre of music begun in 1947 made for and by the black community which was then virtually a separate world in America. But to many the music’s ultimate success only came when it found unlikely crossover appeal into the mainstream starting in the mid-1950’s against stringent opposition from society. Yet that also proved to be the downfall of its true legacy, as with a far larger and more powerful white audience now turned on to the music the subsequent history of rock ‘n’ roll, which of course was written by that generation of white listeners, completely excluded the era which had preceded their own discovery of it and which had thrived in an entirely separate community. As a result the first seven years of rock got all but erased in the blink of an eye. So when trying to reconstruct the ruins there’s going to be a lot of skepticism by those encountering it who’ve taken the years of revisionist history as gospel truth. Even the biggest hits and the biggest artists of the 1940’s are bound to have their inclusion in rock’s history questioned by some, particularly because virtually none of them were still churning out hits during that 1954-1955 crossover period. So at best the names of Roy Brown, Amos Milburn, Wynonie Harris, The Ravens, The Orioles, Paul Williams and the like – the biggest rock stars of their day – are resigned to being called “early influences” and then quickly pushed aside to get to more familiar names from a more well-documented era. The few who did manage to last long enough as headliners to be recognizable to that later generation – Big Joe Turner, Johnny Otis, Ivory Joe Hunter – were older and thus able to be presented as elder statesmen enjoying brief late career stardom thanks to their connection to rock more than being seen as the vital revolutionaries that had launched the entire enterprise with their work years earlier. But here we have one who slipped through the cracks of that defense. Someone who was just a kid herself when she scored right out of the gate on an historically venerable label in Atlantic, and whose career was still going strong into the late 1950’s when the entire world was aware of the music. Decades later, when few rock stars who’d gotten their start in the 1940’s were still around, this one was winning Grammy Awards for her records and Tony Awards for starring on Broadway, single-handedly keeping the long neglected era she’d thrived in from being ignored completely. Ruth Brown therefore is the one figure who can bridge those eras and audiences and her continued presence on the scene ensures that the full history of rock can’t possibly be told without her. The Ruth Brown story is far too vast, and far too interesting, to merely give a succinct overview here, but since it’s kind of important that newcomers starting at the beginning of all of this actually know who we’re talking about and the turbulent manner in which she launched her career we’ll do our best to relay the vital points while recommending her excellent autobiography Miss Rhythm as a more appropriate and informative starting point for learning about one of the true immortals of rock ‘n’ roll. 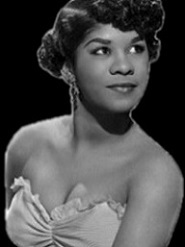 Ruth Weston had left her hometown in Virginia in 1945 at 16 years old to sing professionally after getting her start singing in church, then doing secular material at local USO shows in Norfolk during the war which had even led to an Amateur Night win at the Apollo Theater in New York. The next year she met Jimmy Brown, an 18 year old Navy vet who played trumpet and sang in an acrobatic crowd-pleasing style, sort of Jackie Wilson before Jackie Wilson. The two formed a show they called Brown and Brown and their ensuing popularity up and down the Eastern seaboard put them on the track to something akin to stardom for non-recording singers. When they were about to head to her home state to perform they decided to get married to stave off questions from her friends and family about the show’s name and the impropriety of their relationship. The union didn’t last long but the name did and when she was back on her own in Detroit Lucky Millinder saw her and offered her a job singing for his band. Life seemingly could not get much better than that. But Millinder never had her perform, instead he had her watch Anisteen Allen, his top female vocalist, for a full month of shows. Finally in Washington D.C. he let Brown sing two songs that went over very well with the crowd. What didn’t go over well with Lucky was seeing Ruth getting sodas for the guys in the band at their request after the show. Millinder fired her, saying he’d hired a singer not a waitress, and ignominiously left her stranded in the nation’s capital without money or a job. There she was taken under the wing of Blanche Calloway, Cab’s sister, who ran a bar where she let Ruth perform. Her talent was immediately evident as the club’s popularity grew with her as the featured attraction and Calloway soon became her manager. When Sonny Til of The Orioles came into the club one night when Brown was singing she launched into their big hit, It’s Too Soon To Know, which so impressed dee-jay Willis Conover who was there with Til that he called Ahmet Ertegun and Herb Abramson of Atlantic Records to tip them off to Brown’s potential. She signed with Atlantic and none other than Jimmy Brown, her estranged husband who’d been off chasing other ladies along with fame and fortune, re-entered the picture, kissing up to Ruth in an effort to latch on to her forthcoming opportunity as she was scheduled to appear on a bill at the Apollo Theater. Because of his insistence on being included they decided not to take the bus as planned and en route the car they were now traveling in crashed outside of Philadelphia, breaking both of Brown’s legs so badly that the police on the scene took one look at her and said, “Forget the girl in the back, she’s dead”. She wasn’t of course and after the typically stellar police work had been overcome Brown wound up hospitalized for months. Her no account husband left once again because he didn’t see future for himself with “a cripple”, but Ertegun and Abramson had a lot more class. Say what you will about the future royalty payment discrepancies and the conflict of interests with her management and publishing (and we certainly will, rest assured), but they paid the balance of her hospital bills after insurance covered the bulk of it and most importantly they kept her spirits up, along with keeping their word to record her as soon as she was able. 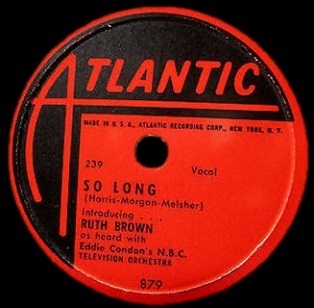 Still on crutches seven months after the crash she cut her first official session with Eddie Condon’s group behind her and it was with a new arrangement of the decade old chestnut So Long that Ruth Brown was unveiled to the world. What’s immediately evident upon hearing her sing is that Ruth Brown didn’t need rock ‘n’ roll nearly as much as rock ‘n’ roll needed her. Though rock has seen female singers with more dynamic voices than Brown possessed, few ever matched her learned skills. From her phrasing to her strong projection, her intelligence when it comes to grasping a song’s deeper meanings and her commitment to each song’s emotional qualities, Ruth Brown was a singer’s singer. She certainly had an impressive voice, great tone and masterful control, but her greatest asset by far was her versatility. She could sing ANYTHING and make it sound utterly convincing. But that’s what initially stumped Atlantic Records when it came to recording her. They were still sort of floundering about, though their success in rock with Tiny Grimes, Joe Morris and lately Stick McGhee showed what seemed to have the most commercial potential, but they hadn’t quite gone “all in” on it, at least not intentionally. Instead they had cast a wide net with skilled artists blurring lines between styles and just so happened to discover it was the style that adhered closest to the emerging rock scene which worked best. Whether they knew how to actively pursue that ideal however still had yet to be proven. That’s the case here with So Long, a song, an arrangement, and with a backing unit that falls somewhere outside the normal rock parameters, even at this point. 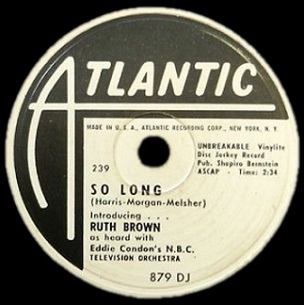 Though it’d go on to be an influential record for future rock acts – Johnny Ace would re-craft it for his debut hit, My Song in 1952, and everyone from Big Maybelle and Aretha Franklin to James Brown and, ironically considering Sonny Til’s minor role in Ruth Brown’s discovery, The Orioles would all cut versions of Ruth’s debut hit themselves. But the song itself originated in 1940 with Russ Morgan, who also co-wrote it, and The Charioteers had a notable rendition that same year, both using a flowery stilted presentation that just a few years later by 1949 already sounds archaic. It had also been done by Little Miss Cornshucks in 1943, who happened to be Ahmet Ertegun’s favorite singer, and certainly there’s vestiges of her take on it in Brown’s version in some of the vocal phrasing, but while Cornshucks’ rendition is reasonably effective (and it’d become perhaps her signature song), by contrast Ruth Brown’s performance is magnetic. It’d almost be hard NOT to envision Brown becoming a lasting star upon hearing this. Right from the start her voice swells with understated power and dripping pathos. We’ve used the term “soulful” in the past to show how rock tapped into the deeper emotional undercurrents of songs to forge a more powerful connection with the listener and this is a prime example of it even though one of the most frequent qualities of that term thus far has come via gospelish touches, something Brown eschews entirely here. But what she uses instead of that technique is just as gripping however, rising and falling in volume, alternately breathy and forceful, bearing down hard on certain passages and then letting up with a shocking lightness of touch until you’ve been dragged through the emotional wringer. At one point the erstwhile professionals in Condon’s band stopped and said something to the effect of, “Hold on, fellas, let’s back up and take this seriously. This girl can SING!”. Unfortunately for as solid a group of musicians as Condon’s crew was they were still stuck in the past. Eddie Condon was a respected jazz guitarist who’d never make, or even try and make, the transition to rock ‘n’ roll and it shows here. The backing is appropriate for what Brown does with it vocally, so one can hardly complain unless of course one is trying to differentiate between what rock’s best attributes were and what this music was attempting to do instead. Though nowhere near as dainty as the pop versions, or even Cornshuck’s six year old rendition, there’s still too much dross here to match Brown’s feelings of devastation at facing the end of a relationship she’ll never forget. While she’s holding back tears, they’re only casually offering her a handkerchief. When she starts to pour her guts out they shuffle their feet and awkwardly look around wondering if anyone else in the room is uncomfortable with her uninhibited display of grief. In other words theirs is a pop-centric arrangement complete with trumpets and light-fingered piano accompaniment. Other than extended intro there’s no standalone spot for them, which we can be thankful for I suppose, but that means all of the heavy lifting is done by Brown who doesn’t disappoint. For somebody in her first true session (she’d cut a single song back in April to see how she sounded with Amos Milburn sitting in on piano no less) Brown takes control of the mood and meshes with the musicians with her vocal choices. She never steps wrong, it’s first rate through and through, but it’s also a full step, if not two, away from what would get it to qualify AS rock on its own. That the song is included here is due 100% to who’s singing it, and moreover what’d she go on to do in the near future. That could be seen as a detriment when it comes to assessing So Long I suppose. But what else it shows is that Ruth Brown from the very start was SO good that whatever she sang, in whatever way she sang it, was almost a style unto itself, capable of fitting into whatever genre you wanted it to be. Had she never gone on to become associated with rhythm then maybe this kind of ballad would be left out of rock’s story, but luckily for us she soon left no doubt she was a rocker through and through, leaving all questions as to its appropriateness moot. When it hit the Top Five on the charts it not only launched her as a star, in the process becoming the biggest hit by a female artist in rock to date, but also turned around the record label she was now recording for. As introductions go So Long may indeed be atypical, right down to the title bidding farewell from someone who was only just starting out in life and who’d remain a vital presence on the scene for more than a half century, but atypical or not, like Brown herself it’s a class act all the way. Leave a reply on "Ruth Brown: “So Long”"